The Bible teaches that in the end times, right before the return of Jesus, the greatest political leader in the history of Mankind will emerge from Europe. After taking over that area by diplomatic cunning and deceit, he will launch a military campaign that will result in his acquiring "authority over every tribe and people and tongue and nation" (Revelation 13:7). His empire will be the most extensive in all of history, encompassing the entire world, and his rule will be the most demonic the world has ever experienced. He will begin his rise to power as a dynamic, charismatic, insightful, visionary leader who will astound the world with the cleverness of his solutions to world problems. He will appear to be the savior of the world. But as he consolidates his power, his true nature will be revealed. He will emerge as a Satan possessed and empowered person who hates God and is determined to annihilate both Christianity and Judaism. For this reason, he is identified in scripture as the Antichrist (1 John 2:18), for he will stand against God and His anointed one, Jesus Christ. It is interesting to note the spike in those who support the Antichrist coming out of the United States (39 of the 762 respondents, 5%), most likely higher than in the past because it is an election year. The ministry was flooded with emails from folks asking if because of his magnetism and mass appeal, Barack Obama could be the future world leader. As we'll discover in this five-part blog series on the Antichrist, based on the biblical description we can foresee Obama losing an election for that prophetic role. 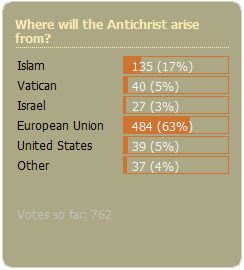 A time existed when many believed the Pope will be the Antichrist, and there are still some who hold to that origin (40 of the 762 respondents, 5%). But, popularity for who most believe is a certain candidate for the Antichrist lies in the time period when the question is asked. The rise of Islam today has certainly made many swing their views, with our poll showing 135 of the 762 (17%) of respondents now believing the Antichrist will be a Muslim. So, who is right about where will the Antichrist arise from? Or, more importantly, what does the Bible say? We'll dive deep into the Bible and Dr. Reagan's article "The Rise and Fall of the Antichrist" to root out the apocalyptical dictator's origins, beginning tomorrow with his character. I think Javier Solana fits the bill of the antichrist, and his Office was created by a document entitled Recommendation 666. He's kind of the EF Hutton, when Solana speaks everybody listens! I Googled Javier Solona and discovered he is married with 2 children. According to Nathan's excerpt from the Bible, the anti-christ will not desire women (he may be homosexual). So it looks like this Solona guy is likely not the anti-christ. Also, the Bible says the number of the beast is in correlation to his name, not a document. We're not supposed to be worrying or putting great effort into figuring out WHO the anti-christ is, but rather keep our eyes focused on CHRIST and HIM alone! As Christians we need to be getting our lives and hearts right, making ammends and repenting and turning from the sin in our lives and SHARING THE MESSAGE OF HOPE AND SALVATION THROUGH OUR LORD AND SAVIOR JESUS CHRIST! NOW is the time. Start LIVING for CHRIST and helping to further the Kingdom--there are still so many lost in this world and THAT is where God want our hearts and minds focused! Anonymous...CHILL OUT! We are commenting on an article about the anti-christ so what do you expect our comments to be "focused" on. What you say is true but not relevant. Commenting on a blog doesn't change our devotion to Christ. Focus on YOUR relationship with Jesus, not OURS. We are fine.